Stride Toward Freedom: The Montgomery Story. New York: Harper & Brothers, Publishers, 1958. Early printing of Dr. Martin Luther King’s first book, author James Baldwin’s copy with his signature to the front free endpaper. James Baldwin was an American writer whose work dealt with race relations and sexuality. A native of Harlem, he left the United States for France in 1948 to pursue a writing career. While in Europe he published Go Tell It on the Mountain (1953), his first novel, which catapulted him to literary fame. In 1957 he returned to the U.S. to lend his voice to the cause of civil rights. Baldwin dissected the American racial conundrum in fictional works and powerful essays, as well as in speaking engagements. He met Dr. King in 1957 when he was writing about the Civil Rights Movement for Harper’s magazine and attended the 1963 March on Washington. Octavo, original half cloth, illustrated. Very good in a very good dust jacket. An exceptional association, linking two of the greatest African Americans of the twentieth century. 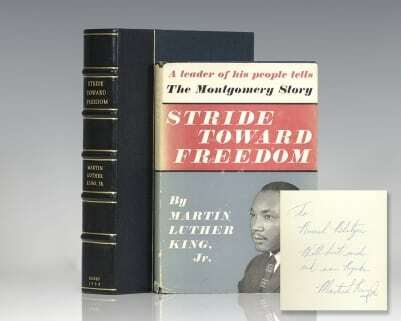 "God is interested in the freedom of the whole human race": Stride Toward Freedom: The Montgomery Story; Inscribed by Martin Luther King, Jr.
First edition, early printing of Dr. Martin Luther King’s first book. Octavo, original half cloth, illustrated. Boldly inscribed by the author on the front free endpaper, “To Russel Bletzer With best wishes and warm Regards Martin Luther King, Jr.” Near fine in a very good dust jacket. Housed in a custom half morocco clamshell box. "Nonviolence is directed against forces of evil rather than against persons who happen to be doing the evil. It is evil that the nonviolent resister seeks to defeat, not the persons victimized by evil": First Edition of Stride Toward Freedom: The Montgomery Story; Signed by Martin Luther King, Jr.
First edition of Dr. Martin Luther King’s first book. Octavo, original half cloth. Boldly signed by Martin Luther King, Jr. on the front free endpaper. Review copy, with the slip laid in, near fine in a very good dust jacket with some fading to the spine and light wear. Housed in a custom half morocco clamshell box. First printings are uncommon signed. New York: Harper & Row, Publishers, 1963. First edition of Dr. King’s second book, of which Coretta Scott King noted, “If there is one book Martin Luther King, Jr. has written that people consistently tell me has changed their lives, it is Strength to Love.” Octavo, original half cloth. Presentation copy, inscribed by the author on the front free endpaper, “To Murray Stavers With Best Wishes and appreciation for your support Martin Luther King.” Fine in a near fine dust jacket with light wear. 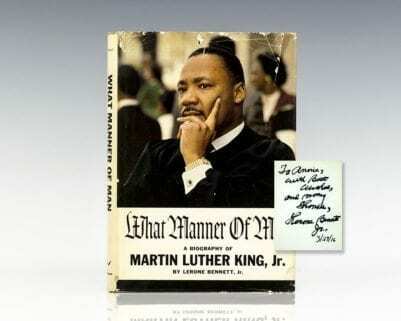 Rare and desirable signed and inscribed by Dr. King. First edition of Dr. King’s second book, of which Coretta Scott King noted, “If there is one book Martin Luther King, Jr. has written that people consistently tell me has changed their lives, it is Strength to Love.” Octavo, original half cloth. Presentation copy, inscribed by the author on the front free endpaper, “To Major Ernest D. Muse With Best Wishes Martin Luther King.” Fine in a very good dust jacket with light rubbing and a few small closed tears. Housed in a custom half morocco clamshell box. 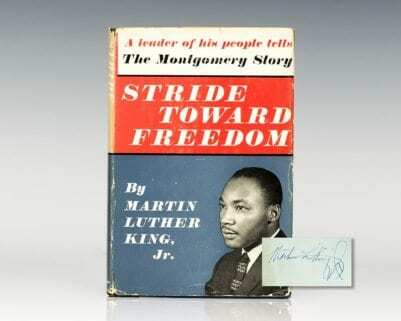 Rare and desirable signed and inscribed by Dr. King. Early printing of Dr. King’s second book, of which Coretta Scott King noted, “If there is one book Martin Luther King, Jr. has written that people consistently tell me has changed their lives, it is Strength to Love.” Octavo, original half cloth. Presentation copy, inscribed by the author on the front free endpaper, “To Tamar Rich with best wishes and warm regards, Martin L. King Jr.” Laid in is a black and white photograph of Ralph Abernathy, Victor M. Carter, Martin Luther King, Jr., Andrea Carter, Tamar Rich (the recipient) and the Consul General of Israel. Fine in a near fine dust jacket with light wear. 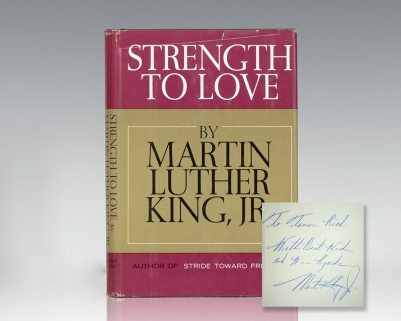 Rare and desirable signed and inscribed by Dr. King. First Edition of What Manner of Man: A Biography Of Martin Luther King, Jr; Inscribed by Lerone Bennett, Jr.
King Jr., Martin Luther) Lerone Bennett, Jr.
What Manner of Man: A Biography Of Martin Luther King, Jr.
Chicago: Johnson Publishing Company, Inc, 1964. First edition of this early biography on Dr. King. Octavo, original cloth. Lengthily inscribed by the author on the front free endpaper. Near fine in a very good dust jacket with some closed tears. With an introduction by Benjamin E. Mays. Jacket design by Herbert Temple. Uncommon signed and inscribed. Early printing of Dr. King’s second book, of which Coretta Scott King noted, “If there is one book Martin Luther King, Jr. has written that people consistently tell me has changed their lives, it is Strength to Love.” Octavo, original half cloth. Boldly signed by the author on the front free endpaper, “Best Wishes, Martin Luther King.” Also laid in is an original photograph of Dr. King. Contemporary name to the pastedown, near fine in a near fine dust jacket with light wear.